2019 is already shaping up to be a very special year for us. KLOTZ has been synonymous with high-quality cable products since 1979, and that’s naturally something we’ll be celebrating in style. Our HA-HA-AOCW Optical HMDI Cable on drum is ideal for screening movie masterpieces in large-size locations. Lossless and 4K! Dante™ audio networks are widespread – even in smaller or medium-size performance venues or theatres. To meet this need we’ve developed the NA2IOSET, a complete set comprising 100 m of RamCAT cable on drum, Dante interface and four M1 microphone cables. 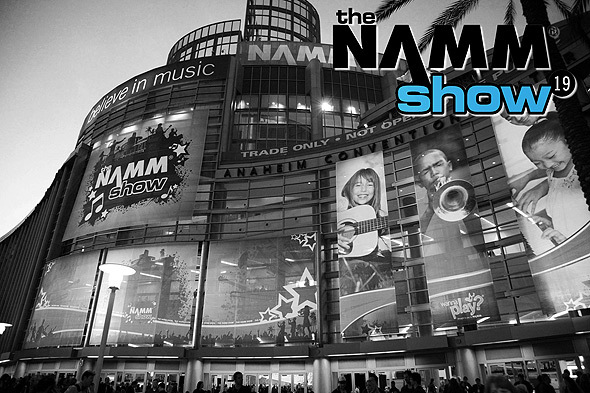 As every year, the end of January sees us heading off to California for the NAMM Show. Anaheim once again turned into the center of the music industry! In the world of pro audio and video, the name of KLOTZ has been synonymous with cable products of the highest quality since 1979. Today we are global leaders in the design, production and marketing of audio, video, multimedia and fibre-optic cables. Our products are used by equipment rental companies, recording studios, TV broadcasters, theatres, stadiums, arenas and even cruise ships. We are constantly extending our expertise to span peripherals, designing connection technology systems tailored to our cables. We are a well-established major partner of the music retail business, supplying a comprehensive range of products related to instrument and audio cables. We supply over 2,500 specialist retailers worldwide. Many of our customers have relied on our speaker cable solutions for years as a fast, simple and high-quality way of connecting their line arrays and point source speakers. Many speaker manufacturers are also familiar with our top-class solutions and appreciate their quality. This has enabled us to build up our reputation as an attractive OEM partner. No wonder, then, that we decided to join forces with BOSE Scandinavia and develop a cable solution for the new Showmatch system that’s now available to our customers. “In response to popular demand from our customers, we developed a cable-based product that brings together the analogue world with the world of DANTE™", explains Florian Frick, Product Manager at Neutrik AG. NEUTRIK’s new NA2-IO-DLINE is an “end-of-network” device with two inputs and two outputs for four analogue connections simultaneously. “The NA2-IO-DLINE provides the possibility of sending and transmitting signals at the same time. This means our customers can save the costs of investing in new equipment, while still making the most of all the technical capabilities of the system”, says Frick with pride. At KLOTZ AIS we’ve gone a step further and included Neutrik’s NA2-IO-DLINE interface in a complete set. The set comprises the Dante™ Interface, four KLOTZ M1K1FM Prime microphone cables with XLR connectors in length 10m, and one RCBEEW100 – our top-selling flexible RamCAT cable drum system with dual shielding, AWG24 solid conductor and etherCON connectors. Expanding your existing Dante™ network has never been easier! An Oscar-winning masterpiece is the most fun in maximum picture and sound quality. The HDMI cable HA-HA-AOCW.. from KLOTZ transmits pictures in HD and sound in Dolby Digital or DTS easily and reliably - even in 3D or in the new 4K x 2K or quadruple full HD picture standard. Interference-free thanks to active glass fibre hybrid cable technology (AOC), which is also thinner, lighter and more flexible than classic HDMI copper cables! As every year, at the end of January the bright California sun in Anaheim shone down on the NAMM Show, presenting the hottest trends and new products in the MI industry. The KLOTZ AIS stand had the usual array of new products and ideas for the MI and ProAVM sectors, and offered the chance to rub shoulders with some of the artists from our #KLOTZfamily. This year, visitors and artists alike were particularly interested in our TITANIUM premium cable and the RockMaster, FunkMaster and Joe Bonamassa Signature cables. RamCAT products for network solutions and our versatile TrueLink, StraightLink and CatLink Stage Boxes were also in the spotlight at NAMM. As well as the product displays and shows, there was naturally also plenty of time for gear talk and in-depth discussions. Once again, the 2019 NAMM Show in Anaheim was a huge success! 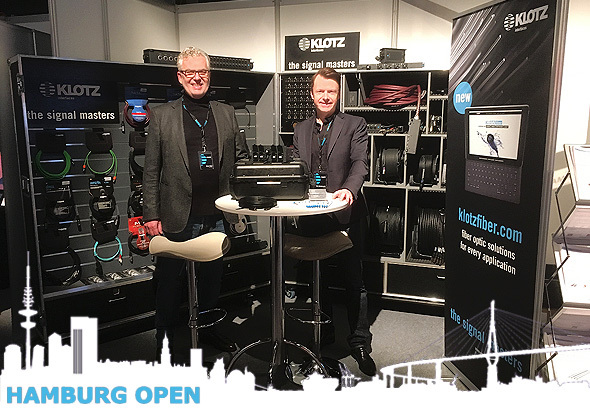 This January Hamburg hosted one of the highlights in the trade show year for the broadcast and media tech industry – Hamburg Open, now in its tenth year. The event has become a must for us, offering the opportunity to present our new products and best-sellers in the fields of fibre optics, RamCAT networks, premade cables, SMPTE camera cables and HD-SDI video cables. Our thanks go to all our business partners and interested visitors who came to our stand this year. You all helped to make Hamburg Open a huge success for us at KLOTZ AIS! We’re already looking forward to next year – see you there!